Here’s an odd curio that I spotted down in Menlo Park at the U.S. Geological Survey campus. 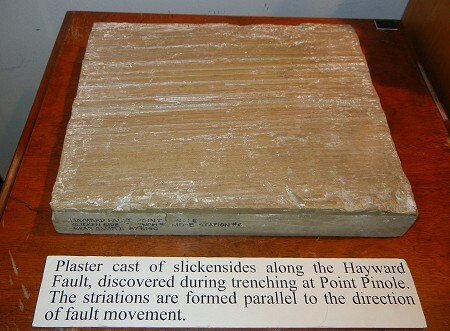 During a trenching study of the Hayward fault up at Point Pinole, the active trace was uncovered and this plaster cast was made. It sits by the entrance of the Map Sales Room in Building 3. Today we would make a lidar scan of a surface like this to document its slickensides in a precise database. But you have to feel some affection for this low-tech artifact, which presumably has also been scanned to ensure its immortality. This entry was posted on 9 June 2014 at 8:06 pm and is filed under The Hayward fault. You can follow any responses to this entry through the RSS 2.0 feed. You can skip to the end and leave a response. Pinging is currently not allowed. That is a really cool photo, thanks for posting it!